During our series about how much of a problem Malware can be, we took a look at three of the top utilities that can eliminate it. However, we would be remiss if we didn’t cover another top trusted choice out there called SuperAntiSpyware which can detect and remove over a million threats. Installation is pretty straight forward and easy following the install wizard. During installation make sure to check for the most recent updates for the detection database. This is always a great feature in security software so you’re sure to have everything up to date right away. Another feature to enable during installation is to have SuperAntiSpyware keep an eye on the homepage for Internet Explorer so something shady doesn’t hijack it. There is a great Main Menu to control all of the functions and features. Of course not everything is available with the free edition but enough to detect and clean the malware. The features available are adequate and comparable to other free spyware utilities out there. To do a manual update go into Preferences and under Automatic Updates click on Check for Updates Now. Place a check next to the box allowing update checks each time it’s started. With the free edition there are enough features to do the job, however for some of the advanced settings the Professional version is required which runs $29.95. The professional version allows Real-Time Blocking, Scheduled Scans, Registry Protection, Auto Scanning, Automatic Daily Updates, and Free Email Support. In tests a Quick Scan took just under 20 minutes, this may seem like a long time but this utility really scans files thoroughly. The best option is probably to create a custom scan so it is not wasting time on music and video files. There are three types of scans which are Quick, Complete, or Custom. 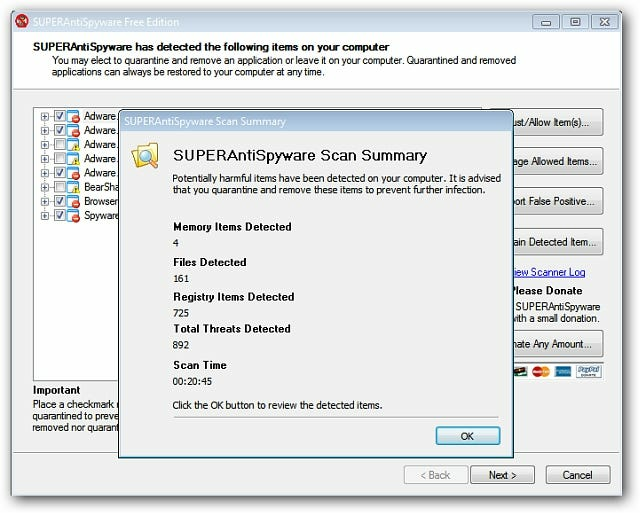 SuperAntiSpyware definitely does what it claims insofar as detection of and removal of malicious software. It was able to identify and remove almost 900 instances of malicious junkware. SuperAntiSpyware boasts being able to detect over 1 million malicious threats from Spyware, Adware, Spyware, Adware, Malware, Trojans, Dialers, Worms, KeyLoggers, HiJackers, Parasites, Rootkits, and others. This is good to know and gives a user piece of mind when it comes to security of their PC. If you have a nasty infection this can be a great tool for discovering issues that other programs may not see.